On 4 April, NATO will mark the 70th anniversary of its founding. The North Atlantic Treaty laid out theAlliance’s core security tasks, chiefly amongst them the collective security and defence of all of its members. [TEXT OF ART. 5 OF THE WASHINGTON TREATY.] The fundamental values and principles anchored in the Treaty helped to create the most successful political and military alliance in history. Throughout these seven decades, NATO has strived to secure a lasting peace in the Euro-Atlantic region, safeguarding the security and freedom of all Allies. This has never been an easy task, as the political and military environments have been constantly evolving. But collective defence and common security remain the twin pillars of the Alliance. During the Cold War, NATO focused on collective defence and the protection of its members from potential threats emanating from the Soviet Union. Following the collapse of the Soviet Union, along with the rise of non-state actors affecting international security, NATO adapted by utilizing collective defence, managing crisis situations affecting the security of all allies and encouraging cooperative security through tailored programmes of political dialogue and practical cooperation with different partners. This shift led to the Czech Republic, Hungary and Poland joining the Alliance in 1999, the first countries from the former Warsaw Pact. In 2019, these countries will celebrate the 20th anniversary of their membership in NATO. It is easy to forget that years of lively debate preceded this historical NATO enlargement. At the time many experts were unsure about the merits of accession of former socialist states. They had different views on the possible impact of enlargement on Alliance cohesion and solidarity, as well as on its relations with Russia. Published in 1995, NATO’s study on enlargement concluded that admitting new members would strengthen the Alliance’s ability to contribute to European and global security. This conclusion remains valid today, strengthening NATO’s “open door policy” which is based on Article 10 of the Washington Treaty [TEXT OF ART. 10 OF THE WASHINGTON TREATY.] Any European country seeking NATO membership must be able to demonstrate that it meets certain requirements, including a functioning democratic political system based on a stable market economy, the fair treatment of minority populations, a commitment to the peaceful resolution of conflicts, the ability and willingness to contribute to NATO operations, and, last but not least, a commitment to democratic civil-military relations and institutional structures. That leads us to another important date to be remembered in 2019. Indeed, next year Ukraine will mark the 10th anniversary of its first Annual National Programme (ANP), a key tool for Ukraine to get closer to NATO. Through the ANP process, Allies advise and assist Ukraine on its reform path. Recent steps taken by the Ukrainian government to make this instrument more effective are a welcome development. Reform goals should be well-defined, coherent, funded and measurable. In this context, 2019 will also see key steps to be taken to implement the provisions of the Law on National Security (LNS), adopted by Ukraine in June 2018. This Law is the result of close collaboration between Ukraine and its international partners and is seen as an important step towards bringing Ukraine closer to European and Euro-Atlantic standards and principles. As the framework guiding security and defence sector reform, a number of other important laws and normative acts need to follow. Verkhovna Rada Committee should be created for this purpose. NATO stands ready to support Ukraine with further advice and expertise in this regard. The LNS also provides for the reform of the Security Service of Ukraine (SSU). A new Law on the SSU should provide for the transfer of specific law enforcement functions (in particular in the area of fighting corruption and economic crimes) to relevant law enforcement agencies. A strict delineation of competencies and duties with those agencies and with Ukraine’s intelligence sector will be a crucial step for the SSU to become a trusted partner in the European and Euro-Atlantic security and intelligence community. 2019 will also be a watershed year for the implementation of defence reform. A number of Ukrainian planning documents, notably the Strategic Defence Bulletin (SDB), set ambitious goals to be achieved by the end of 2020. Much effort and dedication needs to continue to be invested in the implementation of the reform objectives contained in the SDB and codified in the LNS, so that they move from theory to practice. As part of the reform process, Allies recognize that Ukraine’s Armed Forces have come a long way. Their tactical and technical capabilities have increased significantly, and they continue to benefit from bilateral training and equipping programmes from a number of NATO Allies, as well as from participation in NATO-led missions and operations. Areas of progress include – but are not limited to – combat capability, development of non commisioned officers, capability-based planning, and unified medical command. The Ministry of Defence has done laudable work on practical issues that required prompt solutions. But for Ukraine to become more secure, the focus should firmly remain on the systemic, comprehensive, institutional approaches needed to make reforms sustainable and irreversible. Ukraine needs both strong political will and full commitment at the working levels to implement STRUCTURED reforms despite understandably difficult circumstances. NATO stands ready to provide practical support to Ukraine in this endeavour, based on the wide range of experience of our own members. The Alliance will also continue to provide practical support to Ukraine through more than 40 tailored support measures contained in the Comprehensive Assistance Package (CAP), adopted by Allies at the Warsaw Summit back in 2016. It includes a range of Trust Funds, capacity-building programmes and advisory support. Our Medical Rehabilitation Trust Fund is helping wounded servicemen and women get the treatment they need, and helping medical rehabilitation institutions across Ukraine with modern equipment. Our Cyber Defence Trust Fund is providing equipment to strengthen Ukraine’s resilience to cyber-attacks. And in the framework of the C4 (command, control, communications, and computing) Trust Fund we are also supporting a Regional Airspace Security Programme, to help Ukraine better handle air security incidents. Through the NATO-Ukraine Platform on Countering Hybrid Warfare we share experience and lessons learned to become more resilient to the complex threats and challenges we collectively face. The CAP has facilitated alignment between NATO’s advisory assistance and Ukraine’s reform goals to make Ukraine stronger, more resilient, and better able to provide for its own security. 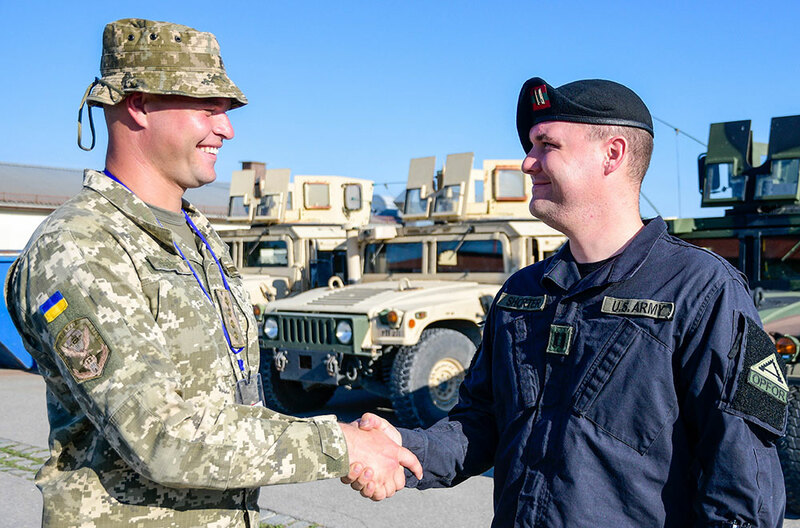 NATO advisers work closely with their Ukrainian counterparts, and a core group of advisors at the NATO Representation to Ukraine contributes significantly to Allied and wider international coordination efforts. Last but not least, 2019 will mark one more significant date – the 20th anniversary of the establishment of the NATO Liaison Office in Ukraine (NLO). Established in Kyiv in April 1999 to facilitate Ukraine’s participation in NATO’s Partnership for Peace programme and to support defence reform efforts, since 2016 the NLO forms – together with the NATO Information and Documentation Centre – a constituent part of the NATO Representation to Ukraine. Over those two decades, the scope of the NLO’s activities has grown significantly (as has the number of its staff) to encompass the full range of NATO-Ukraine political and military dialogue and practical cooperation. What has remained unchanged is our belief which underpins everything we do – that an independent, sovereign and stable Ukraine, firmly committed to democracy and the rule of law, is key to Euro-Atlantic security. 2019 will be a challenging year for Ukraine. But with that challenge come new opportunities to strengthen public institutions, the rule of law, economic competitiveness and the security and defence sector. And NATO, as a long-standing and reliable partner, is committed to continue supporting Ukraine going forward.